Kiern Jewiss delivered another series of brilliant performances in the Douglas Motorsport Ginetta G40 at Croft Circuit at the weekend. 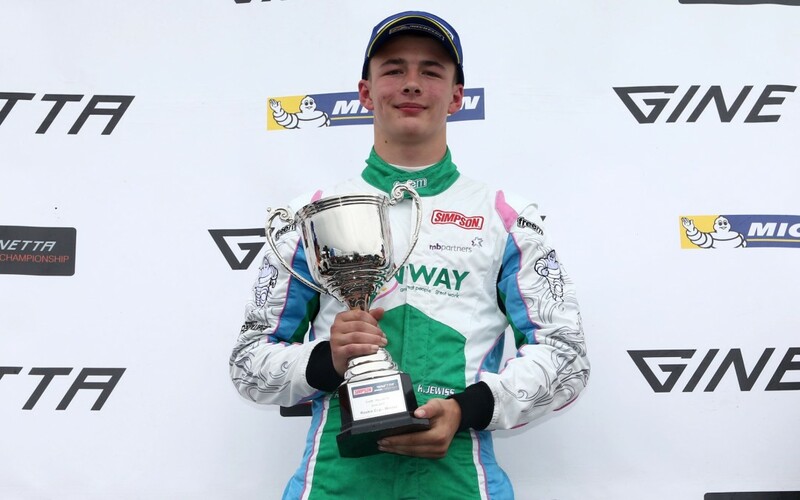 He completed a hat-trick of second places in the overall race which has put him in 3rd place overall in the Ginetta Junior Championship – 2 points off second place, and extends his lead in the Rookie class to 88 points. Dan Harper had to battle hard over the weekend but managed to pick up valuable points by finising in P7, P6, P8 in the three races over the weekend. Kiern Jewiss has been a consistent performer in the Ginetta Junior series. It only took the first two rounds for Kiern to find his feet and delivered a 2nd place overall in only his third race, followed by another 2nd place two races later.